Could one of the NFL's most explosive receivers be on the move? 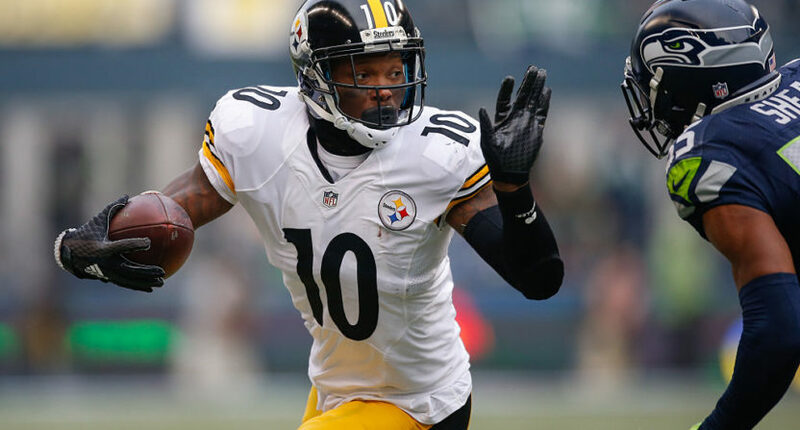 Martavis Bryant has been a Pittsburgh Steeler through a knee injury, frustrating inconsistency, a pair of suspensions, a missed season, two promising campaigns, 15 touchdown passes, two more playoff scores and loads of explosive plays. But it sounds as if the receiver’s time with the team that drafted him could be nearing its end. Late Sunday night, NFL.com’s Ian Rapoport reported that the 25-year-old Bryant had requested a trade out of Pittsburgh amid a somewhat slow start to the season. Sources: #Steelers playmaking WR Martavis Bryant recently requested a trade. His teammates and coaches are well aware that he’s unhappy. In his first year back from a suspension, Martavis Bryant was integrated slowly into the offense. 2 catches today. Ready for a new start. Soon, ESPN’s Dan Graziano confirmed the report. Bryant’s girlfriend, Deja Hiott, reportedly tweeted that the Steelers “should have seen it coming. Taking him off the field, not giving him the ball or the chance to reach his potential,” before quickly deleting the message. But just when the world was writing a eulogy for Bryant’s time in Pittsburgh, the receiver tweeted that he was “happy to be a steeler” and that he “can’t wait to reach number 7 this year,” referring to the franchise’s championship count. Now, this could be just a token non-denial denial, a way of quieting talk about his departure just a bit and assuring Steelers fans who might be unhappy him. Then again, he didn’t have to tweet anything, let alone something so enthusiastically Steeler. But we have no reason to doubt Rapoport and Graziano’s reporting, and if it had been flatly false Bryant likely would have said so, so there seems to be something here. The question is, what happens next? ESPN’s Jeremy Fowler reports that the Steelers still value Bryant and do not plan to trade him. That makes sense, as Pittsburgh would likely have trouble getting a good return for him midseason, even letting alone his disciplinary issues (i.e. his enjoyment of marijuana). Early indications are the Steelers do not plan on trading Martavis Bryant, according to sources, one of which was pretty adamant. Perhaps that can change closer to trade deadline, but seems unlikely. They still value him. So for now, it appears Bryant will remain a Steeler, whether he likes it or not. Through six games, the speedy receiver has 17 catches for 231 yards and a touchdown, as Pittsburgh stands at 4-2 and first in the AFC North.